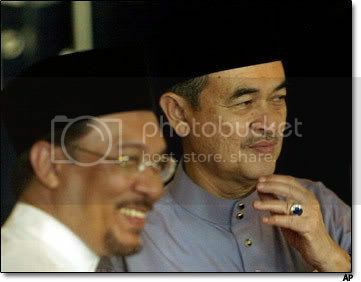 Infernal Affair When Anwar Is Right Everyone Remember; When Anwar Is Wrong Everyone Forget! When Anwar Is Right Everyone Remember; When Anwar Is Wrong Everyone Forget! Now, let's do some brainstorming! Is Abdullah really that bad? I don't think so. 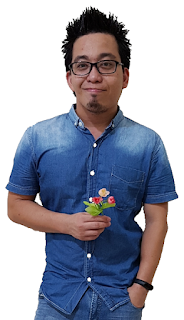 You guys still remember Ahmad Ismail whom I had openly "stabbed" in my previous post? The Bukit Bendera Assemblyman made a bigoted statement against the Chinese, dismissing them as "squatters" and labelling them as "jews". Of course, critics from all sides both the BNs and the oppositions seized on this opportunity to blast him for making such insensitive public comment. And of course, Abdullah, our so-called sleepy PM stepped in and had an UMNO supreme council meeting to suspend Ahmad Ismail from UMNO for 3 years. But as predicted, many in the PKR or neo-Malaysians and me strongly thought that Abdullah didn't do enough to deal with the issue. The neos claimed that Abdullah is useless and racist in handling Ahmad Ismail. There was this outrage and wrath that Ahmad should be sacked...and I personally fill that he deserved to be detained under ISA in Kamunting. ~Ahmad Ismail suspended from UMNO for 3 years. ~Najib stoop low to apologise on Ahmad's behalf. ~Abdullah is portrayed as an ineffective, xenophobic, sleepy lameduck. Now let us use our "magnifying glasses" and compare (or stark contrast to be more precise) on how Anwar handled his Kulim Miracle, or if you like PKR's soapbox orator-Zulkifli Noordin. This firebrand purportedly incited the raiding of the Bar Council Forum a la Apcet II. What's more: there were uses of abusive language, aggressions and threats to halt the forum. Zulkifli wanted to abrupt the forum based on pure assumptions. He sure is very democratic and Islamic huh? So who is insulting Islam right now? Even Haris Ibrahim from Peoples Parliament Forum had accused Zulkifli Noordin+Salehuddin Ayub as: "lying, deceiving and manipulative politicians for fear-mongering the Artcile 11." So where are those PKR's hecklers who had lambasted Ahmad Ismail and Abdullah? And remember: UMNO at least had suspended Ahmad. What had Anwar done for his part then against his Miracle Boy? The Neo-Malaysians who had castigated, remonstrated and admonitioned Abdullah was nowhere to be seen and no voice to be heard when Anwar take no action at all against the Kulim's Zulkifli. He did promised to take action against him...but did you hear anything? Where's Lim Kit Siang? Where's Nik Aziz? Isn't this an action of hypocracy? ~Anwar was let off the hook. 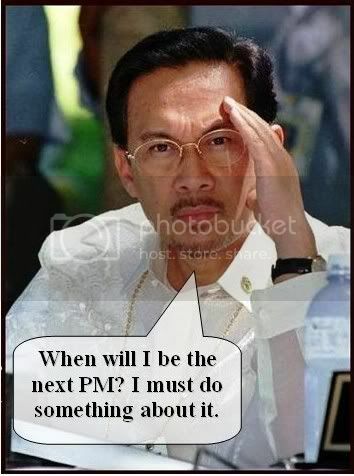 ~Anwar's still Malaysians' saviour (at least in the Neo-Malaysians' eyes). It's easy. Anwar has been fashioned as Malaysians' only saviour that can help them from the current, presumed "sorry state". Anwar is seen as the only leader out there that can cleanse "filthy" Malaysia's from corruption and economy slump. Wow! Then he surely is God-sent huh! I hope he can reduce the fuel by 70 cents at least. 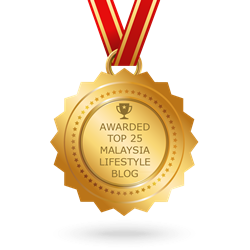 The deal is, Malaysians (or just the Neo-Malaysians) had conferred the IMMUNITY to Anwar. 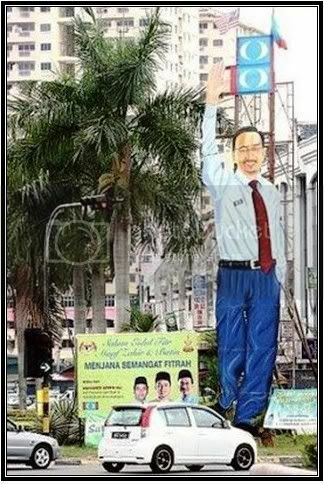 Yupe, Anwar is worshiped and idolised by his supporters right now regardless of his integrity. What does this denote? Well, basically he's immune to everything. Anwar is untouchable by anyone right now. That's why he is not punished for mollycoddling his Miracle Baby-Zulkifli. Could this be the truth right now? When Abdullah is wrong nobody forget! So is Malaysians treating Abdullah fairly? the current one is definitely no good. but the future one still unknown. maybe good maybe not good. but not bad giving it a try. Hmm...I don't think so. BN's unscrupulous bunch might have let some people down but not abdullah. Anwar and Najib might be smarter than Abdullah but none of them is as courteous and nation-loving as the former! Actually, I think Badawi is a nice man, he is in fact responsible for making Malaysia more democratic, and people are now more vocal than ever. The only problem is, he is not a very good leader in that he's not firm enough and listens too much to what other politicians tell him. I salute him for being brave enough not to contest the next election, he had the military under him and could have used the military to do what he wanted. I'm not so sure about Najib being the next PM. If he's involved with Altantuya, then he would not make a good PM.